Some days you're going to want to eat cake or ice cream or burgers. Some days you're going to crave a candy bar. Some days you'll be able to curb that sweet tooth with a banana smoothie (recipes below). Some days fruit won't do. Last week I was craving chocolate. I was able to ignore it for a day. 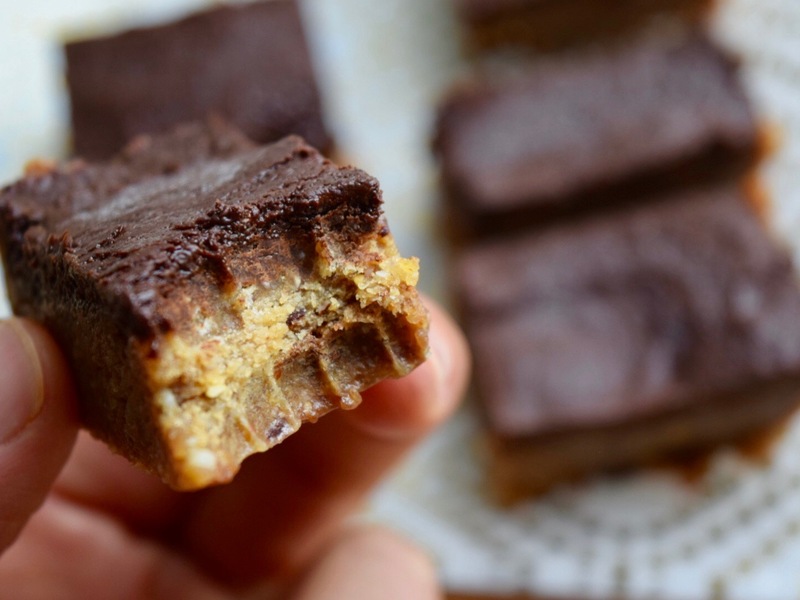 On the second day I made these no-bake chocolate peanut butter bars. They are delicious. They are rich. They are SUPER dense. A little bit will go a long way. When it comes to things like this I cut them into tiny pieces (about the size of a Reese's cup) and put 1 or 2 of them in their own plastic baggies and store them in the freezer. I'm not so great with self-control so after eating a few too many of these I sent the rest to work with Jason. He didn't mind. Pulse oats and almonds in a food processor until smooth. Add peanut butter, butterscotch extract (or vanilla) and medjool dates (make sure to remove pits and stems) and pulse until a ball of nougat has formed. Press dough into a 9×9 pan. Mix 4 oz of unsweetened baking chocolate and 4-6 tablespoons of maple syrup (the more maple syrup you use the sweeter it is but the more crumbly the chocolate becomes) together in a small saucepan and heat over medium heat. stir constantly. Pour melted chocolate over the peanut butter mixture and place in the freezer for 30-60 minutes. Slice into 16 pieces and serve.